09/10/14 -- ARES/RACES Volunteers Mobilize in Wake of Nevada Flash Flooding. ARES/RACES members in Clark County, Nevada, activated Monday, September 8, after heavy rains sparked flash flooding. They deployed after being called up by local emergency managers to support communication during recovery efforts in the Moapa Valley northeast of Las Vegas. At least two people died as a result of the flooding. 8/29/14 -- The 2014 Global Amateur Radio Emergency Communications Conference (GAREC 2014) held August 14-15 in Huntsville, Alabama, and hosted by the ARRL Alabama Section and the Huntsville Hamfest, offered an opportunity for participants to share presentations and perspectives from around the globe. Greg Sarratt, W4OZK, organized this year's GAREC event, which focused on the application of advanced technologies in disaster response and emergency communication. Full story here. 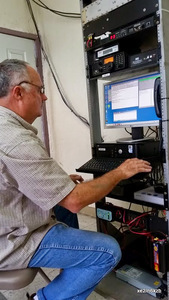 From an Amateur Radio user's perspective, the Statewide Amateur Radio network (SARnet) is simply a network of independently operated, amateur, UHF, voice-radio repeaters in Florida that are linked together. In truth though, it is much more than that. SARnet is a story of the Amateur Radio community coming together to help a state government agency overcome a technological challenge. The state agency in question is the Florida Department of Transportation (FDOT). The FDOT is an agency charged with maintaining roadways in the state of Florida, keeping them safe for the traveling public. To meet its charge, the FDOT deploys personnel that work along these roadways. To communicate, these workers use VHF low-band analog voice radios that operate in the mid 40 MHz range, just below the amateur 6 meter band. The agency operates thousands of radios through dozens of repeater sites all over the state, 24 hours a day, 365 days a year. The repeaters are networked together in regional districts on a statewide Intelligent Transportation System (ITS) microwave and fiber network. In an effort to continue to keep this workforce safe, while at the same time improving resource utilization and situational awareness for both crews and management, the FDOT has been working to provide interoperability between the regions of this voice radio network, the capital in Tallahassee, and other public safety agencies. This sort of improvement requires technology and any new technology needs testing before it can be deployed. This is where the Amateur Radio community comes in. Recently, the FDOT needed to begin investigating connecting their VHF repeaters together using a relatively new Internet Protocol (IP) technology called multicast. This powerful technology makes it possible for multiple radio sites to be connected together while using only the network bandwidth of one conversation. Traditional voice over IP network implementations put one copy of the conversation on the network for each radio site, using more and more bandwidth with each site that is added. The problem with starting this investigation of multicast was that the FDOT voice radio network is a live network. Testing a new complex technology on a live network would be, at best, frustrating for the work crews on the roadways, and at worst, downright dangerous since it would likely result in radio system outages. Fortunately, many of the principal FDOT personnel responsible for operating the statewide ITS microwave network and supporting the FDOT VHF voice radio network are also Amateur Radio operators. They decided to enlist a few Amateur Radio repeater trustees to let them network their repeaters together over the FDOT statewide ITS microwave network. The idea was that the FDOT could create an ongoing test bed for this new multicast network technology using live Amateur Radio traffic, and in return the amateur community would get a new exciting resource to use for communicating long distances in and around the state of Florida. The win-win has so far been a great success. In fact, the test bed created by the SARnet has provided numerous insights for the FDOT into how to test, operate, maintain, troubleshoot, and upgrade an advanced technology like multicast when it is being used on such a large scale. There have been several challenging issues that the FDOT, working side by side with the radio amateurs, have been able to solve. Most recently, a new repeater was linked to SARnet in Madison, Florida. Initial reports, and even recordings, from local hams indicated that the SARnet traffic was cutting in and out, with short audio blanking segments. The evidence provided by the amateurs suggested a network issue was to blame and indeed upon investigation the problem turned out to be an intermittent microwave network card that had not been detected previously while running typical IP traffic through the network. For the amateurs who use SARnet, the experience is proving to be a lot of fun, but it has also become more than that. The potential for SARnet to support public event, disaster response and emergency communications is impressive. Consider that SARnet rides on a statewide network of hardened microwave tower and fiber sites and NOT the Internet. All of these sites have battery systems and automatic generators with extended fuel supplies that can run for many days, if not weeks. Consider also that the bandwidth used by SARnet on this network is dedicated. That means when the Internet begins to experience outages during a severe weather event here in Florida and most Internet-based amateur repeater linking protocols, such as Echolink, Allstar, D-Star, and WIRES, are having difficulty maintaining connections, SARnet will still be fully operational. The amateur disaster response community has already embraced SARnet. The Duval County, Florida EOC conducts a weekly check-in net on SARnet on Fridays at 9AM, where late check-ins are welcome. In addition, the National Hurricane Center has expressed an interest in using SARnet from their location on the Florida International University Campus in Miami. Returning to the Amateur Radio user's perspective, it turns out working with SARnet is really easy. If you have a nearby UHF repeater that is connected to SARnet then when you access it, like you would do any normal day, you bring up that repeater, but you also bring up all of the other SARnet UHF repeaters simultaneously around the state. There is nothing different, equipment-wise or even frequency-wise, that you as a user of your local repeater need to do to access SARnet. It does help to say where you are though during a contact so other hams on SARnet will know if you are local or not. The planning behind SARnet is largely complete and the construction is underway. Twelve SARnet repeaters are connected as of early September with another 4-6 planning to be connected before the end of the year. Ultimately the network will likely consist of approximately 25-30 repeaters, covering most of coastal regions and some interior areas along interstates. The size of the network was chosen by FDOT as being representative of how they will deploy the technology on their own voice radio network. If you are interested in the technical details behind how the repeaters are connected on SARnet you will find them on the SARnet website, along with frequencies, approximate repeater locations, and a rough coverage map. The website is www.sarnetfl.com. The national ARRL Simulated Emergency Test (SET) is slated for the weekend of October 4, although the window for operation is September 1 through November 30 each year, with groups conducting their events over the course of 48 hours. We are in that window now. The SET is a nationwide exercise in disaster response and emergency communications administered by ARRL Emergency Coordinators and Net Managers. ARES, other related groups and the National Traffic System (NTS) are involved. The SET gives communicators the opportunity to focus on their capability, strengths and weaknesses within their community while interacting with NTS nets. It also provides a public demonstration -- to served agencies such as Red Cross, Emergency Management and through the news media -- of the value to the public that Amateur Radio provides. The SET helps radio amateurs gain experience in communications using standard procedures and a variety of modes under simulated disaster response conditions. Many ARES groups across the country will be participating, and all ARES members should support the national SET and their local ARES group's activity, but as an adjunct, you as an individual operator may want to consider also conducting a more micro, local approach by conducting your own SET for your home station and neighborhood. Develop an appropriate scenario based on the existing risks for your area: a wildfire, tornado, earthquake, or hurricane, perhaps. Recruit a few friends and neighbors down the street to participate as assistants and "victims." And then play it out: simulate the onset of disaster conditions, put into effect your family's personal incident action plan, ensure their safety and the stability of your immediate home and environment, and then assess the needs of your neighbors. Establish communications with other hams in your immediate area via simplex, and then expand your coverage and capability to a local repeater and an HF outlet - a county or other regional ARES or NTS net - along with a channel to emergency support functions needed, based on your scenario parameters. The 2013 SET Results were published in the July 2014 issue of QST. Alabama placed first in the SET ARES Activity Score and Georgia took second place. In the NET Activity Score, Georgia took first place and Alabama took second place. Mike Watkins, WX4AL, Alabama Section Emergency Coordinator offered a "job well done" to all Alabama ARES members who participated in the 2013 SET. Alabama ARES is growing, reports Watkins: "In the 2012 SET, only 18 counties participated. In the 2013 SET, 21 counties participated." Alabama ARES continues to develop its SET strategies and exercise design to maximize the points that local groups can achieve by carefully examining the points structure of SET. By designing a SET scenario that addresses and maximizes good results in every point category in a straightforward uncomplicated exercise, local groups both big and small will achieve two goals: A good score and a strengthening of the relationship between Alabama ARES and its partner agencies. The video www.youtube.com/watch?v=pVZlK6M8WQ is a presentation that describes "The Interoperability Continuum," a plan to improve communications by following "a path to achieving optimum interoperability by broadening relationships." "Knowing who the players are around you" is mission critical and to quote from the video: "The reality is, the most important ingredient in interoperability is relationships." "Relationships count and mean something." Cherokee County (Georgia) ARES member Randy Kerr, KD4KHO, is featured in the video. Examples of communications during 9/11, Hurricane Katrina, floods, and forest fires are discussed. Communications issues and what the Incident Action plan does to improve and overcome issues before a disaster happens is presented. The events of last month surrounding the south Napa, California earthquake, a Richter scale 6.0 temblor, remind all of us, especially those on major fault lines of the country to be prepared to respond to them. FEMA reminds us to expect aftershocks. These secondary shockwaves are usually less violent than the main quake but can be strong enough to do additional damage to weakened structures and can occur in the first hours, days, weeks or even months after the quake. During an earthquake, drop, cover and hold on. Minimize movements to a few steps to a nearby safe place. If indoors, stay there until the shaking has stopped and exiting is safe. If it is safe to do so, check on neighbors who may require assistance. Use the telephone only for emergency calls. Cellular and land line phone systems may not be functioning properly. The use of text messages to contact family is the best option, when it is available. Amateur Radio and CERT communications offer viable alternative public notification and messaging systems. Check for gas leaks. If you know how to turn the gas off, do so and report the leak to your local fire department and gas company. The ARRL Centennial Convention in Hartford, Connecticut, in July, was one of the finest and most memorable conventions I've ever visited. I saw many old friends there, one of whom was Dale Clift, NA1L, a former ARRL Headquarters colleague when we worked there together in the early eighties. He had become a QRP CW enthusiast, and I became fascinated with his stories of portable QRP mini-expeditions around New England with an antenna he highly recommended: the Buddipole system. It happened that the manufacturer had a booth at the show, and Dale and I spent an hour with their competent reps. Their knowledge, Dale's good experience with the antenna, and my ever-present quest for quality Amateur Radio products for my own station, all conspired to cause me to open my wallet for a simpler antenna by the same company called a Buddistickâ¢. It's a portable, vertical antenna for 40 meters through 10 meters, for use with any transmitter up to 250 watts. The engineering is superb, and the quality of the components is top shelf. It is evident that the product was a labor of love by this company. The reason I am including this in this newsletter, is that the antenna fills many of the needs of the disaster response or public service event communicator for an effective and efficient HF antenna system that is small and portable, strong and sturdy, and quickly assembled and disassembled. The Buddistick is packaged in a compartmentalized 1000 denier cordura portfolio bag and includes 2 aluminum arms (blue or black), one standard telescopic whip, one adjustable coil, 2 coil clips, mounting kit, a complete counterpoise system, as well as a good operating manual. Included is one 31' radial on a line winder for use on all bands 40 meters through ten meters. I mounted the mounting plate to a railing on my deck with the rubberized clamping knob. On the aluminum plate is an SO-239 connector for a coax feed (I used a 25 foot run of RG-8X); and the mounting adaptor for the arms, coil and telescoping whip. I was able to assemble and mount the antenna to my railing in under three minutes. I ran out the entire length of the 31 feet of radial wire, keeping it elevated off the ground, and attaching the end (on the winder) to a fence post. My radio is an ICOM IC-7000, with about a 100 watts output, and a low SWR. I think it's a good idea to have a small antenna tuner in line, and I run the LDG IT-100 auto tuner and Bird 43 wattmeter. You can tune the antenna by ear: I simply connect the coax to my radio, set the Buddistick so I can reach the coil from my radio, turn the VFO to the frequency I want. Swipe the mini-banana plug that is attached to the bottom of the coil in an up and down motion. I listen for max signal and/or noise, and then place a tap in that position. I check the SWR to see if it's okay, I adjust the radial for resonance, and my antenna tuner to get the SWR down even further. My friend Dale uses an antenna analyzer with his Buddipole system. A few additions to the history of Amateur Radio disaster response and emergency communications as presented in the last issue: The Central Gulf Coast Hurricane Net was active in providing disaster response communications during hurricanes Betsy and Hilda in the mid 1960's. The net met for years, initially as an AM net on 3845 kHz, and then moved to 3935 kHz. During the hurricane Camille event, communications with the Mississippi Gulf coast was maintained all night. The city of Waveland, Mississippi, was looking for firefighting equipment for a large fire, but none could be sent until the winds subsided. A three year program to fund Winlink gateways in Mexico was completed recently with the installation of XE1CRG. Mexico is a diverse country where HF communications plays a role in disaster recoveries and during emergencies. While Mexico's infrastructure is complete and modern, there are areas where Internet connectivity does not exist. And so Mexican amateurs who provide support to local Protection Civil offices and other agencies have had a history of using HF voice. We conducted a demonstration for officials in 2011 of various HF data modes. Victor Pinilla, XE1VP, from the University of Mexico was impressed with the portable Winlink HF station and easy delivery to Internet-based email recipients. This started a planning and funding process to install four complete Winlink gateways. To date, four systems at a cost of $20,000 have been established at reliable sites with local area support. Pactor modem. The sites are secure with local battery back-up. All gateways run Pactor and WINMOR 1600. The sites also have packet radio ports for training and local use. Since Mexico is allowed auto-forwarding and Pactor 4 operation, all the gateways participate in the Winlink Hybrid Network, offering radio-only message transport in the event of Internet failure, and MPS (Message Pickup Station) delivery. One site near the Guatemalan border, XE2EOS, loses Internet connectivity from time-to-time but with HF auto-forwarding, email continues to reliably flow. In last month's issue, in the lead article on a brief history of ARES, I recalled my experience in the fifties as a child with a crystal radio set and Burgess batteries. I wrote "Hams worked with the Burgess Battery Company for emergency radio power. Many of us old-timers including myself have used those batteries when we were kids for our crystal radio kits; they looked like tall, thick candle columns!" That was 50 years ago, and while my Dad had set up a crystal radio for me, it did not use battery power. He also had set up an array of electric bells, motors and lights connected to those Burgess batteries on my bedroom table to teach me the principles of electricity -- and for fun, too. Sorry for the technical error.